Draft: 2016, San Francisco Giants, 2nd rd. Bryan Patrick Reynolds...Is a 2013 graduate of Brentwood (TN) High School, where he was a teammate of Arizona Diamondbacks pitcher Robbie Ray...Was named first team All-State and District Player- of-the-Year as a senior...Played three years (2014-16) at Vanderbilt University, where he compiled a .329 average (260-for791), 58 doubles, nine triples, 22 home runs and 160 RBI in 206 career games...Played 21 games with the Orleans Firebirds in the 2015 Cape Cod League and hit .346 (28- for-81)...Was the 59th player chosen overall in the 2016 First-Year Player Draft. Spent his first season in the Pirates organization with Double-A Altoona...Began season ranked by MLB.com as the sixth-best prospect in the system... Ranked fifth among Eastern League leaders in batting and fourth among Pittsburgh farmhands...Made 43 starts in center field, 42 in left field and three in right field... Was the Opening Day starter in right field...Played in four games before going on the disabled list on 4/10 with a left hamate fracture...Missed 42 games before being reinstated on 5/29...His first Double-A home run was a grand slam on 6/13 at Binghamton...Became the Curve's primary center field after Jason Martin's promotion to Triple-A on 6/28... Homered twice on 7/20 at Reading (game one)...Hit a three-run, walkoff homer with two outs in the bottom of the ninth on 7/26 vs. Binghamton to lift Altoona to an 8-7 win...Batted .368 (14-for-38) during a nine-game hitting streak between 8/5-14...Hit .341 (44-for-129) over his last 33 games thru August and September and batted .418 (23-for55) in his final 14 contests...Produced a .325 (66-for-203) average and scored a league-high 40 runs in his 53 games following the All-Star break...Hit all seven of his home runs off right-handed pitchers...Played with Surprise during the Arizona Fall League and hit .188 (12-for-64) with five RBI in 18 games. Spent entire season with San Jose (Giants' High-A), where he led the team in batting, total bases (227) and OPS (.826)...Was named to the California League mid-season All-Star team...Participated in the MLB Futures Game in Miami... Was also named an organizational All-Star by MiLB...Made 50 appearances (48 starts) in center field, 42 appearances (41 starts) in right field and 19 starts in left field...Produced a .365 (42-for115) average and two home runs against left-handed pitchers; hit .295 (111-for-376) with eight homers against righthanders...Hit .340 (34-for-100) in May, .322 (29-for-90) in June and .337 (32- for-95) in July...Fell a double shy of hitting for the cycle while collecting a season-high five RBI on 4/23 at Stockton...Had a five-hit game on 5/21 at Modesto...Hit safely in 17 straight games between 5/20 and 6/9, going 29-for-71 (.408) with 10 RBI... Produced a .334 batting average, 54 RBI and an .888 OPS in his last 85 games, dating back to 5/21...Was ranked by MLB.com as San Francisco's No. 4 prospect and No. 5 by Baseball America following the season. April 20, 2019 Pittsburgh Pirates selected the contract of LF Bryan Reynolds from Indianapolis Indians. April 2, 2019 LF Bryan Reynolds assigned to Indianapolis Indians from Altoona Curve. 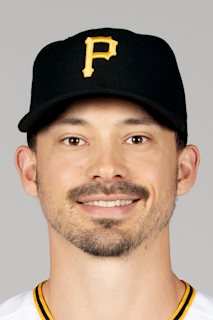 January 5, 2019 Pittsburgh Pirates invited non-roster OF Bryan Reynolds to spring training. May 29, 2018 Altoona Curve activated LF Bryan Reynolds from the 7-day injured list. April 10, 2018 Altoona Curve placed RF Bryan Reynolds on the 7-day disabled list retroactive to April 9, 2018. Left wrist sprain. April 5, 2018 OF Bryan Reynolds assigned to Altoona Curve from Bradenton Marauders. January 22, 2018 Pittsburgh Pirates invited non-roster CF Bryan Reynolds to spring training. January 15, 2018 Pittsburgh Pirates traded RF Andrew McCutchen and cash to San Francisco Giants for RHP Kyle Crick, CF Bryan Reynolds and Future Considerations. January 15, 2018 OF Bryan Reynolds assigned to Bradenton Marauders. July 10, 2017 San Jose Giants activated CF Bryan Reynolds from the temporarily inactive list. July 7, 2017 San Jose Giants placed CF Bryan Reynolds on the temporarily inactive list. March 25, 2017 RF Bryan Reynolds assigned to San Francisco Giants. September 6, 2016 CF Bryan Reynolds assigned to San Jose Giants from Augusta GreenJackets. August 19, 2016 CF Bryan Reynolds assigned to Augusta GreenJackets from Salem-Keizer Volcanoes. June 30, 2016 OF Bryan Reynolds assigned to Salem-Keizer Volcanoes. June 22, 2016 San Francisco Giants signed OF Bryan Reynolds.